There are many ways to start an aquarium business in Bangladesh and any individual can start this profitable business. And there are several ways to start this business depending on your location, investment capacity, and expertise. Additionally, it’s a good thing that you can start the business on either the part-time or full-time basis. Also, you can expect a handsome return from this business within a short duration of time with small to moderate investment. Besides, it’s usually serving both businesses and individuals as the business is to clean and maintains aquariums. It not only let people have a beautiful aquarium but healthy ones without personally cleaning them. but, the most important aspects of initiating a business related to ornamental or tropical fishes is the right business model and strategic planning. Who is this Aquarium Business in Bangladesh right for? If you’re passionate about fish and aquatic life, you may be good for running an aquarium business in Bangladesh. As business owners often work alone but frequently interacts with clients, it’s helpful to be both self-motivated and a people person. And it’s said above that while working another job full-time, this is a type of business that can start as a part-time. Moreover, an aquarium business owner can schedule their service calls for evenings and weekends until a business is established. Besides, the pet stores that sell fish are the ideal clients of an aquarium maintenance business. Because pet stores not only have multiple aquariums that need to be cleaned, but they’re also where people go to purchase fish and fish tanks. Apart from the ongoing work, these stores can be a source of other potential clients. You’ll be able to make a profit in no time with a little determination, creativity, and money from an aquarium business in Bangladesh. So, it’s one of the most profitable retail opportunities to initiate an aquarium shop, which is easy to start. But, keep in mind that the large cities are the only great locations for this business. And it’s vital to secure a commercial retail space for operation. Moreover, you must identify the potential demand and competition both in that particular area before securing the space. Well, let’s see other steps that are essential for an aquarium business in Bangladesh. It’s a well-researched business plan, which is one of the very best tools you can use to make an honest determination to survive and thrive in a business. Not only a bank but most lenders will require that you submit a solid business plan before even considering a loan. You must have an idea about how big the market is before initiating an aquarium business in Bangladesh. This is because fish keeping has become one of the most popular hobbies among thousands of enthusiasts in the country. So, it’s one of the major driving forces contributing to the sales of aquarium accessories is the surging demand for ornamental fish. There are the growing seeking of the products such as aeration equipment, substrate, tanks, ornaments, and fish food to the hobbyists. And it has resulted in the establishment of new stores for the growing interest of individuals in keeping aquarium fish. 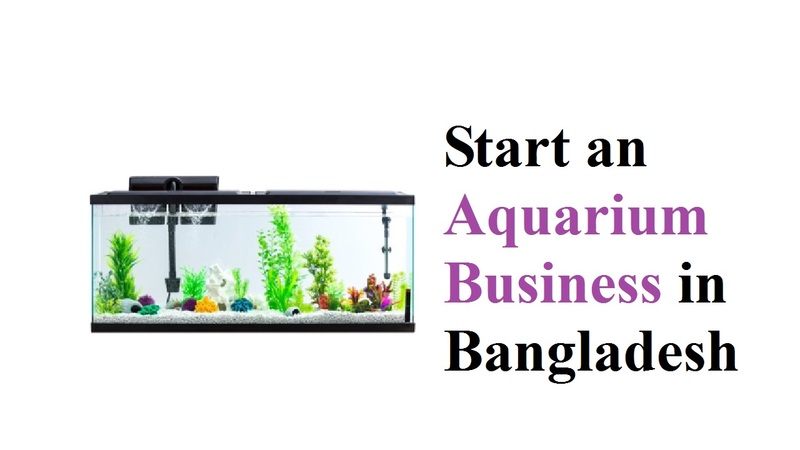 If you want to start an aquarium business in Bangladesh, you must have adequate skill and knowledge. And you must know the different type of aquarium fishes, their feeding habits, behaviors etc at the first of all. Moreover, you must have the skill to handle them along with disease management and other cares. Also, it’s important for you if you’re in this business to know how to maintain aquariums, supplies and the overall cleanliness of the area. That’s why consider working with other reputable companies for some period to get the practical knowledge if you don’t have the prior experience. As a result, like any other business, this one also requires a solid business skill and experience.